In a surprise about-face today, Senate President and 34-year incumbent Mitch McConnell came out in support of congressional term limits. McConnell told reporters he had signed a popular pledge that commits him to “cosponsor and vote for” the U.S. Term Limits amendment limiting senators to 12 years in office and house members to six. 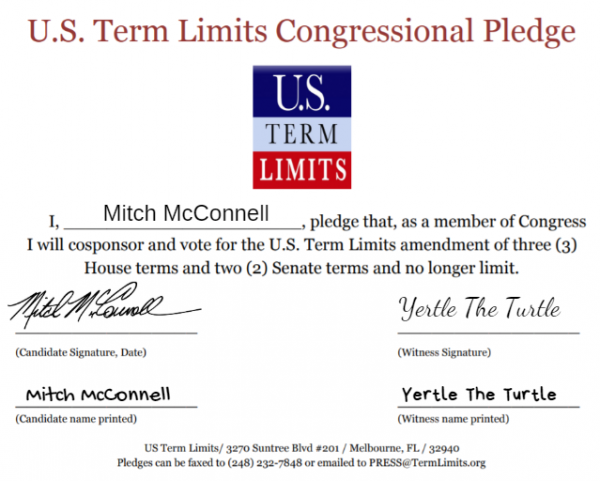 In late 2016, Sen. McConnell had pledged the term limits amendment would never get a hearing in the senate as long as he was its leader. McConnell said he reconsidered his opposition in light of the growing number of cosponsors in the House and Senate and states calling for an amendment proposing convention to bypass Congress if it does not act on the measure. As McConnell spoke, oinking noises were heard from the skies and there was a marked temperature drop in hell.